Queen Letizia of Spain has proven she’s a pro at dressing with flair more than once. She’s worn all black, short shorts and a pink fuzzy coat, among other unexpected outfits for a queen. And at a meeting this week at Fundeu BBVA Foundation in Madrid, the 46-year-old queen made a case for culottes as the new power pants. 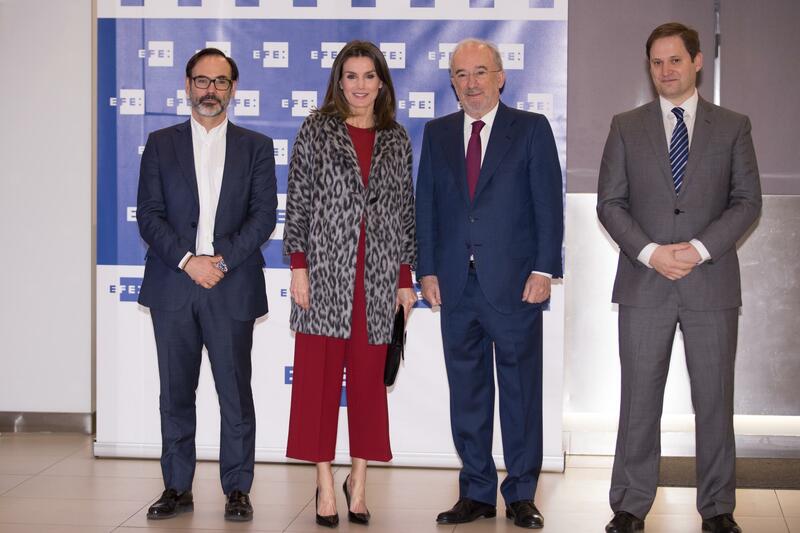 The monarch appeared as polished as ever as she arrived at the Fundeu BBVA Foundation, which was founded in 2005 and aims to preserve the Spanish language and its representation in the media (she is a former journalist after all). Letizia looked to one of her favorite designers, Hugo Boss, to pull together her boardroom-chic outfit. She paired red Hugo Boss trousers with a matching red crewneck sweater and a black and gray leopard-print coat (both also Hugo Boss). Letizia accessorized the look with a Hugo Boss black envelope clutch, and paid homage to her Spanish heritage by incorporating two Spanish brands into her ensemble. She opted for black patent-leather pointed-toe heels by Spanish brand Magrit and delicate diamond earrings from the Spain-based jewelry designer Gold&Roses. Queen Letizia also relied on her signature sleek and straight blowout and natural-beauty-enhancing makeup for the event, although this time around she added a hint of aubergine eyeliner to the mix. From prints to statement colors, Queen Letizia definitely knows how to infuse royal engagement attire with CEO prowess. Now if you’ll excuse us, we’re gonna try and channel that for our next meeting.